Hay! 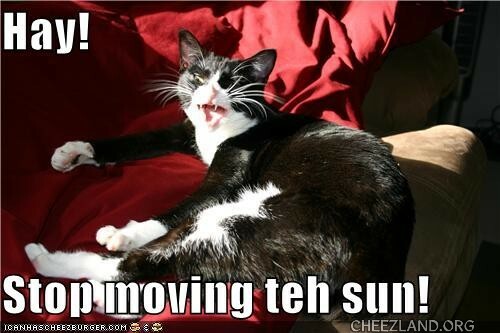 Stop moving teh sun! Ai hazza komfee heer, adn wud lyking tu has a warm tuu! Fankeez, pjp. Nao plz nawt tu moobin it arown enny moar, k? There goes teh sun…doo doo doo doo…. Wun uv mai favrit sawngs, PJP! Altho ai merember it a little differently. . . When teh wurld revolbs arownd U kitteh, sumtiemz teh sun getz shubbed asaid bai yer wurshippurz. Izza hazzurd uf teh pozishun aifinkso. Ai know it’z yoo coz ai saw yoo at teh window !! The nose nose wat the nose nose. Ai is the center of teh yunibers!!! Everthing rebolbes round me!!! * PB throze a lemming-murrang pie in Nenne’s direction to proov this theory * Splat? Or bit? Dis beminds me uv wen Ai wuz halpin at a bus ebent. A fotograffer cumplaned 2 me dat teh sun wuz in teh rong pozishun! In Cheezland, the time is 04:50.